Whether you’re a part of Hong Kong’s art scene or simply an amateur appreciator, you’re likely to have heard the name Chloe Ho — or at least seen her name printed on gallery walls. Her style, which combines the sensibilities of East and West with figurative and abstract aesthetics, is popular with private collectors in London, Paris, Tokyo, Singapore, Hong Kong, China and America, all of whom embrace her form of expression enthusiastically. Ho’s work has been likened to that of celebrated abstract artists such as Zao Wou-ki, Jackson Pollock and Yves Klein. But it’s her use of colour, texture and contrast of dynamics in both traditional and non-traditional mediums, that define her contemporary and unique style, making her an artist to keep your eye on. We recently spoke to this rising art-world star about working with ink, her relationship with technology and the challenges of being an artist. 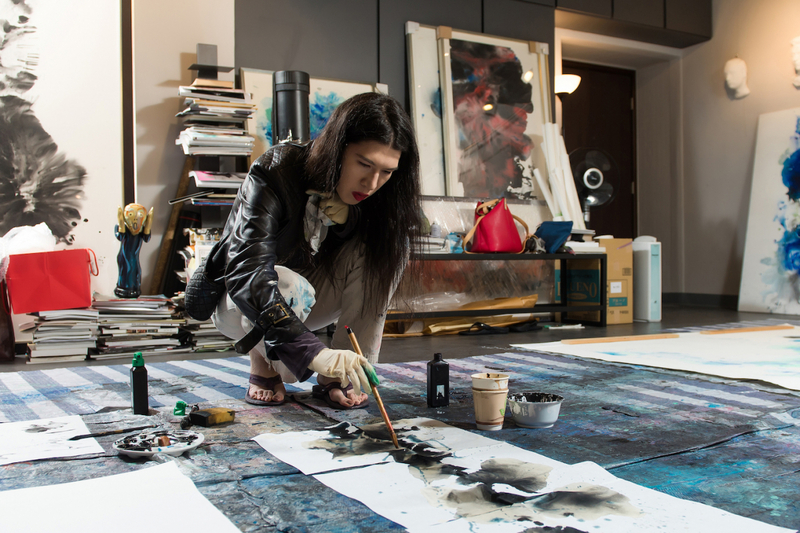 Contemporary artist Chloe Ho working with both traditional and non-traditional mediums in the studio. Tell us about your art background. How did it all start? I started creating art in childhood. I was born in California and grew up in Hong Kong. I studied both Eastern and Western mediums such as Chinese ink painting and watercolour. I later studied in the United States and Beijing. My art is a reflection of this international upbringing. Much of your work features the traditional medium of ink. Why is that? I am drawn to ink for many reasons. Firstly there’s my familiarity and personal history with it: I’ve painted with it since childhood, so it feels like home to me. Ink is more than a medium, it is immediacy, it’s energy and intensity; it is ever changing in the way it meets the paper or canvas. It inspires me because of its beauty and sophistication and its connection with past traditions. Ascendence 1, 2017, Chinese ink & acrylic on rice paper, 218 cm x 277 cm. How about your relationship with technology? In my show ‘Ascendence’, I used VR technology and 3D printing to create multidimensional works in addition to my paintings and drawings. I also wanted to explore how technology expands and actualises one’s potential from a creative standpoint. I think technology will continue to play an interesting role in my artistic expression because it provides the viewer with comprehensive engagement on all sensory levels. I am a painter first and grounded in that practice, but I will continue development in multidimensional art. What are you most proud of in your artist career? I am most proud of how my work has impacted people’s lives or has added to it in some way. I think good art can have healing and life-affirming qualities. I want my art to be an enriching experience for the viewers — and an inclusive one as well. Have you faced any challenges in this industry? The most challenging aspect of the industry for me right now is social media. I recently got Instagram [@theartofchloeho] because people kept asking me if I had one and I’m still figuring it out! Mountain Song, 2017, Chinese ink, spray paint & acrylic on rice paper, 208 cm x 302 cm. How do you feel about female representation in art? As a female artist, I like to represent female figures in different ways and subvert some of the stereotypes of usual female representation. For example, in my ‘Nature Embodied’ series, I like to paint women as active powers and as self-sustaining forces of nature. I also want to capture the internal states of women rather than a superficial and staged image. I think being a female in this way has affected my career very positively because it has provided additional depth to my art. I can bring a new perspective to the table and I’m happy that vision has been so appreciated. I just worked with the Hong Kong Ballet in a collaborative project called ‘Hong Kong Cool’ [an event that showcased seven creations and collaborations between from Hong Kong-based choreographers and local artists]. I exhibited at Art Taipei this year, too, and my work will be showing in MGM Cotai and 3812 Gallery in Hong Kong and London. When you’re not creating art, what do you spend your time doing? I’m always working even when I’m not! I love to read, travel and hang out with my friends and family and my adorable Scottish folds Mcsweet and Mcswank.